The lands around the villages of Southern Tanzania are traditionally split into small family plots or shambas. These yield only enough to feed the families for the year with little left over to raise cash for clothing, medicine and other simple necessities. By co-operating with each other in farming tasks the villagers can learn to maximise their skills and resources leaving time during the dry season to develop a commercial venture. The aim of the Ceramic Roof Tile Project was to create a sustainable, profitable small business, the income from which would ultimately help to improve the quality of life in the village of Magima. The raw materials required for the process were: clay and firewood, clay for making the tiles and for the bricks to build the kiln and wood to fire the kiln - all were available locally. The third element was water and since the water supply in Magima was very poor, the sinking of a new well became a priority. Careful research by the co-ordinator Ntimbanjayo J. Millinga, into this and other development schemes in the area ensured the best use of the available resources. 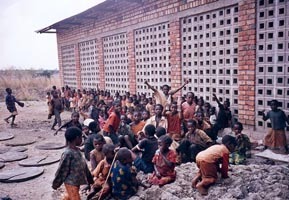 It was planned that project would be owned and managed by the villagers themselves. While the project benefitted and continues to benefit from the support and advice of visiting technicians, the long term success depends on the strength of the workers' commitment and to good management practice. The ceramicist Alice MacFarlane first became involved in the project through Ralph and Noreen Ibbott, who were looking for a skilled and resourceful potter to travel to Tanzania and advise on the design and production of the tiles. 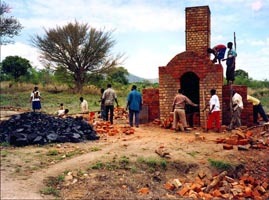 In May 2000 Alice travelled to the area for the first time and spent three weeks working with the group; to source clay, make roof-tiles and build the first wood-fired kiln. The group of villagers working with Alice soon impressed her with their determination and commitment to the task and with the speed and skill with which they carried out the work. Initially the work was done under temporary grass shelters but there was a clear need for a permanent workshop to be built. This would greatly facilitate the making of tiles and providing a better working environment for the tile-makers. It was also apparent that the efficiency and speed of production would be greatly enhanced by the introduction of a slab roller and this and other equipment would need to be housed in a secure workshop. Future development possibilities suggested by the Magima group included the purchase of a kick wheel for the workshop for the production of thrown clay pots. Other products considered were floor and wall tiles. Once production was underway a donkey and cart would be necessary to help with the transportation of raw materials and the finished tiles. Much of this heavy work was initially undertaken by the women of the village who carry heavy clay, buckets of water etc. on their heads. The success of the project relied on fundraising and donations in its early stages after which the aim was for it to be self-reliant. There is a market for these tiles as a replacement for the existing grass or corrugated iron roofs in Magima, in the nearby town of Songea and further afield. The grass roofs require yearly maintenance and the iron roofs soon rust, a tiled roof would not only look much better, it would need little or no maintenance. In the first year Alice made two visits and on the second trip in October, she consolidated the progress already made and initiated the next stage of development. Alice MacFarlane has continued to travel to Ruvuma to support and advise the Magima group during the dry season each year since the project began. The building and equipping of the workshop was largely funded by a Contemporary Art Auction held in the Green Gallery, Aberfoyle in November 2000, when £17,500 was raised. This was possible thanks to the generosity of the contributing artists, the support of Ann and Jimmy Johnston of the Green Gallery and the hard work of a team of volunteers who organised the event. The Project is now working well during the dry season and is producing roof tiles for the Namanditi Primary School Project.